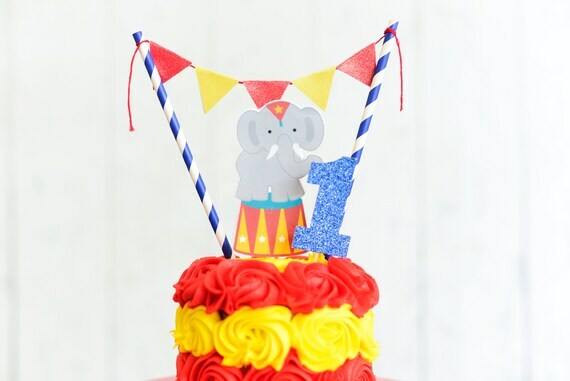 Make your Circus themed birthday party complete with our Circus Elephant Cake topper set. Adding it your home made or store bought cake will make it look like perfection! Our set is designed to fit and look fabulous on a cake up to 6"
We use Magical Papier Mache which is stomped into Card Stock by our in- house Unicorns. Fairies sprinkle it with just the right amount of Pixie Dust before it is being cut into your magical cake topper. Okay, Yeah I know I went a bit overboard here but the cardstock we use is pretty stinkin awesome! We searched and tried many brands and we love our current Non toxic- low-shed glitter-stock! This makes a perfect topper as the glitter will not fall on your cake! And if some does come off..No worries it is non-toxic! YES! It is the same stuff your cake decorator uses on your cake to make it sparkle! I bet they don't have the magic fairies to sprinkle it on top! Or do they? The back of these Magical Toppers is white. The flags are double sided. Got any questions about your topper, need it for a different size cake, different color or want to know the names of our Unicorns? Do not hesitate to hit the message button!